Shooting photos and videos in daylight is easier than shooting at night and in low light. The rules of exposure are the same, but with a few adjustments. When shooting indoors in low light, I have two options to choose from: I get try to get more artificial light onto the subject area or I just change the settings on my camera. After years of trial and error, I have learned which settings work and which ones don’t work as well. I have shared a few tips to help beginners shoot beautiful photos or videos indoors in low light. First, I would like beginners to understand Exposure in photography. Basically, a photo is an exposure. In simple terms, exposure is the amount of light reaching the sensor or film of a camera based on the lens aperture, shutter speed and scene luminance. There are three ways of getting more light into your camera sensor in low light: aperture, shutter speed and ISO. Read on to find out how to adjust each for best results. For all these settings, the camera should be in manual (M) mode otherwise it won’t be possible to change the settings. Ideally, a DSLR camera should be used for low-light indoor shooting as it features wider lenses that capture more light. In addition, these cameras have a lot of useful features that help produce better photos and videos. Aperture is a hole through which the light enters into the camera. The wider the hole, the more light the camera gets. As the hole or aperture gets wider, the f-number (f-stop) gets lower. This is a very important point to keep in mind. Unfortunately, cameras with kit lenses can’t benefit from this step as the maximum aperture they can get is f/3.5, which won’t let enough light get in for best results. I suggest investing in a premium additional lens that features the highest aperture of f/1.8, give or take. These lenses are called “fast” lenses as they let users take photos at faster shutter speeds. Interestingly enough, at f/1.8, the camera sensor gets 4 times more light than at f/3.5. the number is small, but the difference in picture quality will be huge. However, it should be kept in mind that a wide aperture results in a shallow depth of field. So, if the shoot is going to happen in a bar where a lot of people are gathered, the aperture should not be too wide or most of the people in the group may go out of focus. In such a situation, the only way out is to increase the ISO and use an external flash. I own a DSLR that allows me to control the shutter speed. In low light conditions, I use this feature to slow down the shutter to let more light in as the shutter remains “open” for a longer duration. When shooting a video, the ideal shutter speed should be around 1/30th of a second in a room with low light. This produces bright pictures and videos. 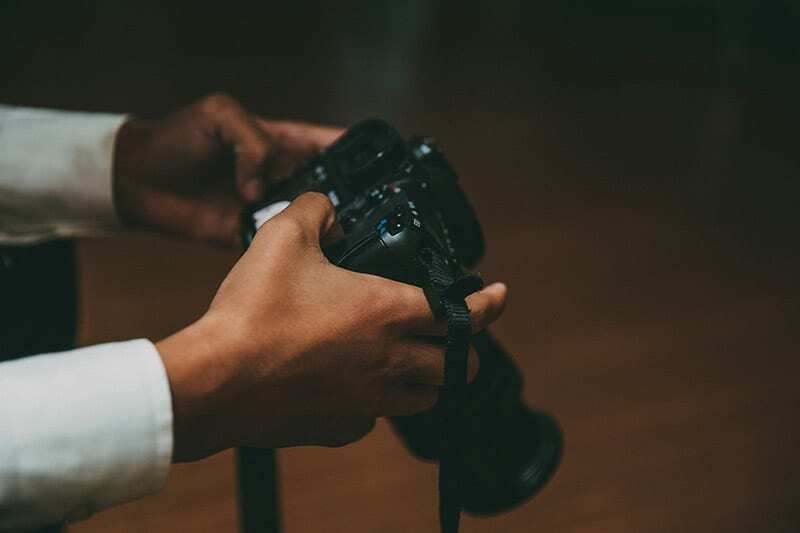 The drawback of lower shutter speeds is that the pictures or videos get motion blur, which may not be acceptable especially when the subjects are moving during the shoot. However, the shutter speed of 1/30th produces normal motion blur. Deciding on a higher ISO number can be a difficult decision as a higher ISO number will produce more noise in the picture or footage, which looks ugly. When I need to achieve the right exposure in low light, I just raise the ISO. However, I do it only after I have tried all other settings. I only use it as a last resort as it does a significant damage to the pictures or videos the camera produces. To be on the safe side, the ISO should not be over 1600. For better results, it’s better to use a powerful external flash instead of the built-in flash. If nothing works, the ISO settings should be raised step by step to see which settings work for the best. Aside from changing the ISO, Shutter Speed and Aperture, below are a few things that can be done to shoot better photos or videos in low light conditions. I use a flash for all low light shots, especially an external one, this is very useful when I need to shoot a group of people in low light. Just because I am using a flash doesn’t mean I don’t need to raise the ISO. In fact, I still keep it at 400 to grab the background details and keep the noise level acceptable. When using an external flash, I make sure that the light bounces off the ceiling or the wall behind the subjects. Alternatively, I use a diffuser for softening the light. Some built in camera flash units are adjustable enabling them to be angled above the subject to bounce light. If used the right way, no one can tell if a photo has been taken with or without a flash. At higher ISO settings, the video or pictures get too much noise. When I get into this situation, I use a noise reduction filter or plugin. The plugins can be used with video editing programs, such as Adobe Premiere Pro, Sony Vegas or Final Cut Pro. These plugins reduce the noise significantly making the pictures or videos look better. However, it is still better to shoot a noise-free video using the settings explained above. So, these are the things that I do when I have to shoot in a dark environment where the light is too low to take good photos. Beginners can follow these tips for better results.